Mobility Illustrated: Comcast Xfinity Gets The Apple Vibe? Really? I have suffered through being a Comcast customer for over a decade. I lived through the ham-handed and still incomplete process of building an Xfinity brand that distanced the product from the company’s massively bad reputation. I even endured some of the worst brand advertising for Xfinity imaginable over the years. Living room audiences of obeisant customers staring admiringly into the white halo of TV light seemed to be their attempt at convincing us we loved our cable. And then there was the Verizon FiOS bashing, which smelled of corporate fear. And then the cute but unconvincing speed commercials with houses racing each other and improbably fast runners on salt flats. They all seemed to overplay the point without proving a thing. And so Comcast was the last company I expected to blow me away with an ad that approaches the simple brilliance of the original Apple iPhone spot. The Future of Awesome spot that I first saw on the NBC Olympics broadcasts is a lyrical, simply put and fully compelling vision of interconnectedness. Your laptop is your TV. Your tablet is your phone. Your subway is a movie theater. Breakfast is when you can watch "Mad Men." Your mobile device is your remote. Your midnight snack in the kitchen is a sports bar. When I first saw this ad it made me sit up. I looked at my wife, who is otherwise immune to any ads involving technology, and even she was paying attention. “That was actually pretty good,” she said. At the risk of praising a company with whom I have been on the phone countless hours ranting, “Get this fixed today or the next call I make is to Verizon,” this ad offered a comprehensible vision of what true mobility means. In the simplest of terms it illustrates through word and image what it means to break down the old silos imposed by tying specific media to specific devices, times, and places. No doubt I am predisposed to gush about this ad because it stroked my own feeling about the implications of mobility. So be it. An interconnected future of the sort we have been building in recent years doesn’t just “untether” us, as many are fond of saying. It disconnects content from device and circumstance. TV is no longer prime time/home/family. Web is no longer desktop/office/backache. Mobile is no longer call/text/person-to-person. Each device is capable of becoming what you need it to be -- phone, movie theater, messenger, remote control, etc. Every moment and place has the capacity to be transformed virtually into another place and circumstance. This ad is brilliant in its ability to lend a sense of wonder and possibilities to a set of technologies that Xfinity itself had trouble endowing with romance. Apple did it with its initial iPhone and iPad ads. The ads made you consider what you could do with these new gadgets. Interconnectedness is a tough concept to make palpable and relevant. This ad does that at its best. There still is that jarring image of a Comcast/Xfinity repairman at your door and the reiteration of that “speed” meme (which I don’t think works). And while I have embedded the long form of the ad here, the first on-air iteration of this series I saw on TV was more effective because it was shorter. As the ad goes on, it trips over its own point of simplicity by cluttering the message with too many examples. We can live without the “Future of AWESOME” breathless end. Again, the spot sometimes seems to misunderstand the source of its own power -- understated, musical, illustrative. Vocal peaks, overstatement and pitchiness work against the main aesthetic of natural, comfortable ease with the new technology. Just as the original Apple iPhone ads gently swiped us to the future of easily connecting desire with fulfillment via a device, this ad at its best drops us into a future that isn’t “AWESOME” so much as it is comfortable with seamless interconnectivity. Still, there is poetry here. The visual rhythm matches the lyric cadence of the voiceover. 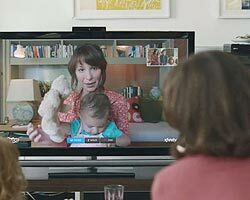 Goodby Silverstein, the agency behind the work, tweeted that it is the beginning of a new campaign for Xfinity. Let’s hope they keep in tune with the Apple vibe that informs the central concept. The agency has been responsible for many of the clever and fun brand ads in recent months, but none I have seen approach this in showing, not telling. Granted -- some of the edits of the original ad have fallen short and lost the lyric flow. For over a century, mass media (film, radio, TV and even Internet) were tied to and validated by specific temporal, physical roles -- nights out in theaters, prime time in living rooms, drive time/office background, office desktop. Media was a ritual. Various kinds of portability (Walkman, laptops, transistor radios) tugged at these rituals and glimpsed something different. But the kind of interactivity, multimedia, connectedness and portability this generation of devices represents is a shift, not a glimpse. The exciting aspect of mobility is that it begs us to get beyond memes like “TV Everywhere” or “Internet at your fingertips” or “Radio on-demand.” History shows that once each medium found its place in American life as ritual it bred new forms of content. Film assembled the modern urban crowd and gave back to that crowd an aesthetic that emphasized personalities in the crowd (the close-up) and industrial pace (the chase scene). Radio and then TV became nighttime rituals of repose in the age of the nuclear family that gave us an art form born of nuclear family -- the sit-com. Drive-time radio put in our cars the ideal car pooler -- a funny and clever passenger. And the Internet embodied the task-driven setting in which the glorified business machine tended to dwell. It gave us the search genre. Don’t for a second believe that TV in your pocket, radio anywhere, Internet in stores, yadda yadda is what is “awesome.” All of those are inevitable, necessarily, wonderfully empowering extensions of the old med we have developed over decades. They are but the first stages of mobility -- where a very new platform uses the last one to make its first steps. The real fun comes when new genres of information, entertainment, and connection emerge from mobility. Check-ins, apps, instant image social sharing, text-to-screen -- all of these strike me as rudimentary lurches toward something novel that uses place, connectivity, multimedia creation and consumption is new-ish ways. But I don’t think we are near awesome yet.